I am a teacher in TN. I've been married over 10 years and have a 6 year old son. I used to drive a motorcycle and stopped when I got pregnant. I miss it often, but just can't risk anything happening to me now that my little one is around. My family and I are Christians and consider our faith and beliefs to be a huge part of our lives. Hey! I noticed you were looking for me a while back. I'm around a little, but not much. Life got very crazy, but is good. Hey Bikergirl! Where did you disappear to? Happy 33rd and wishes for a most beautiful day today and everyday! hey i hope you have an exciting ,wonderful,birthday !!!!! Happy birthday ! Hello there. Just wanted to let you know that JangoBot is back up and running in chat, so everything is functioning properly again. 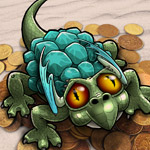 Chat Contest For Dragon Scales Tonight At 7 PM EST! http://www.treasuretrooperchat.com Stop By & Check It Out!